You're in LOVE...shout it out! 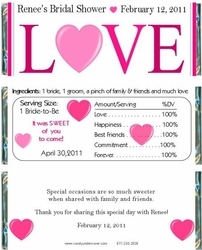 Our BIG LOVE BRIDAL SHOWER CANDY WRAPPER design is bursting with feeling. Your guests will LOVE this sweet token of your appreciation. Chocolate is the Sweetest Bridal Shower favor and is sure to be a hit at your party!